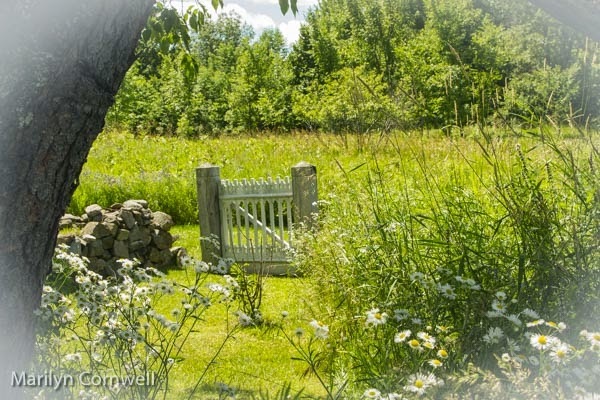 Here's a vignette from the extensive gardens at SpindleTree Gardens, located near Tamworth, Ontario, close to Napanee. This is a private garden open to the public by appointment. There is a large Orangerie, a maze, water gardens, rose garden, bridges, croquet court, and many beautiful plantings. "One of Land O'Lakes signature attractions, SpindleTree Gardens offers a series of gardens with thousands of spring bulbs, perennial walks, rose gardens, formal and informal water features and a unique walled kitchen garden. A tour will take you through an English park setting along meandering paths past a croquet pavilion with miniature historical buildings built by the owners as croquet hoops. This year the curved wings of the newly built Orangery crown the Grand Allée, as flowering black locust trees on either side of the brick and stone walk lead down to the stone staircase and a view of the Maze and Victorian Well Cover. The lower pond and long pond with its connecting waterfall, the lily pond with its goldfish, flowering water lilies and bronze fountain, all designed and constructed by the owners, will enchant you as you cross the arched iron bridge on your tour. The lettuce and vegetables you see in the walled kitchen garden could become part of a light lunch served to you in the Garden Tea room attached to the main house. These gardens are full of ideas which can be interpreted within your own garden. Your visit to the various gardens will inspire both hands-on and armchair gardeners alike. Seating is available at various locations on the tour for rest and contemplation. The many architectural features located throughout the gardens embellish and frame views of flowering shrubs, trees and roses which will delight the senses. SpindleTree Gardens constantly evolves throughout the season. Colourful spring bulbs give way to a tapestry of summer perennials, followed by the blaze of autumn leaves, clouds of asters and waving grasses. Every garden visit is a new experience."